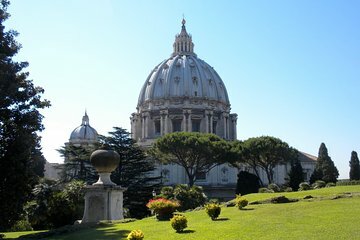 Embárcate en un recorrido inolvidable por los mundialmente famosos Museos Vaticanos con una selección de tres itinerarios hechos a medida. Poco tiempo? Opta por un recorrido de 1,5 horas por la "Plata" y visita la Capilla Sixtina y la Basílica de San Pedro. ¿Primera vez en el Vaticano? Elija la excursión de 2 horas 'Gold' y marque los lugares más destacados de los Museos del Vaticano, como las Salas de Rafael, la Capilla Sixtina y la entrada sin colas a la Basílica de San Pedro. No quiero perderme nada? Regístrese para la gira de 3 horas "Platinum" para una visita completa de las tres atracciones. Dirígete directamente al frente de la cola con los boletos sin colas. Las excursiones de excelente valor incluyen entradas y guía. ¡Personaliza tu itinerario con una selección de tres grandes tours! We were newcomers to Viator and so were a little nervous at first. Now, we're believers!Skip the line is the ONLY way to go! Spend whatever it takes, it's worth it, as is the upgraded tour. Like all Viator guides, our Vatican guide Alessio is a specialist in his field. We definitely benefitted from his knowledge and expertise. The Museums were packed with people, yet Alessio guided us expertly through the maze of people and spoke so movingly and with such reverence about the beauty and meaning around us. Because we'd upgraded our tour, we ended up having a private tour of St. Peter's with Alessio. So worth it. Thank you, Viator. I'm sure the tour guide knew his stuff, but no one could understand him due to a thick accent and the fact that he did not speak into the microphone the majority of the time. The Skip-the line was worth it enough. The tour guide was great and got some amazing information throughout the different places. Highly recommended. Our guide Gaby was excellent! Highly recommend this tour and Gaby! Ok so to start out Ill admit that the review is 3 stars for some reasons not entirely fully down to the fault of the tour guide or group which Ill explain in a minute, otherwise would be 4-5 stars. The Vatican is a must see for anyone in Rome, it is a wonder to go and see and our tour guide Mario was very enthusiastic, knowledgeable and all in all brilliant. He was very good at pointing out the bits we needed to see and the history of the place, the stories of the artefacts and reasons for things being there or sculptured as they were. His short narrative on the Sistine Chapel outside in the gardens was very interesting and explained the meaning behind the frescos and what was being depicted he told us outside as you cant speak in the chapel. Now for the problem part. There was to be a service in the chapel at 2pm, so we rushed through the museum, which was very crowded, to arrive at 1.15 and be denied entry early as it was closing ahead of 2pm. Not the tours fault, but very annoying, given we had rushed through the museum to get there early. At this point we were essentially left with a choice of hoping to get back in at 3pm after the service without the guide for the Basilica which we did or just leave. Not that this was any fault of Mario, but in the end he had to just leave us there and we missed out on the guided tour of the Basilica which we had paid for, which was a shame as he was, as Ive said excellent. So to sum up a bit of a bum deal for us on the day, but defiantly book up and ask for Mario, just check that the Vatican isnt doing a service to ruin your planned day!